I LOVE the fall because I love layering. Here’s a look I love with two staples in my wardrobe: black high-waisted jeans and polk a dot button-up. For this look I kept it simple with two of my favorites as mentioned. I have been wearing my black high-waisted jeans like crazy. I didn’t want to wear all black like I’ve been wearing so I threw on my J. Crew button up. As for shoes I wanted to wear something new so I cuffed my jeans at the bottom and put on my new ShoeDazzle shoes that I absolutely love. Sidebar-Expect a review on those shoes in a future Fashion Forward Friday. As for my coat it’s a coat that I got for a great deal at Kohls. It’s about 2 seasons old, but it’s one of my favorite coats. 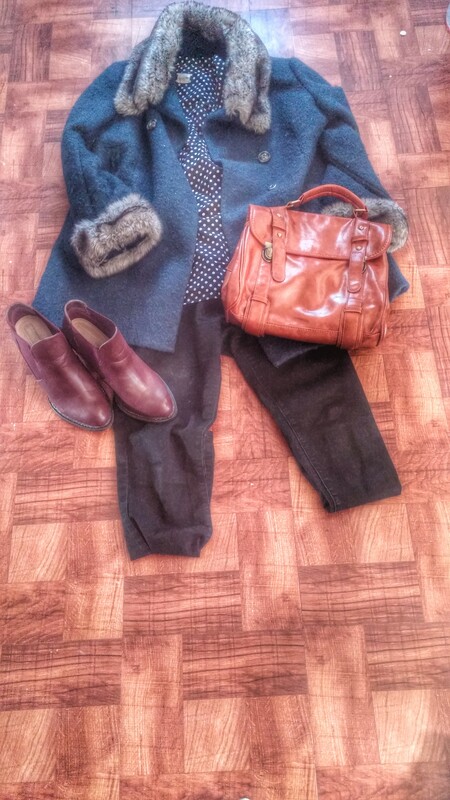 Hence the title of this OOTD, ‘Fancy Coat’. To neutralize the look I decided to wear my Sammy Dress handbag along with Revlon’s Lip Butter in “Fig Jam’ (my absolute favorite lipstick).